New Delhi: Senior Congress leader and accused in the 1984 anti-Sikh riot case Jagdish Tytler on Monday left the stage of a Congress programme at Rajghat. When reporters saw Tytler leaving the stage, then they questioned him whether he was asked to leave as one of the mottos of the programme was communal harmony. Tytler replied: "No! No! Ajay (Maken) is calling me." Then Delhi Pradesh Congress Committee President Ajay Maken was heard whispering into Tytler's ear: ".for sitting Members of Parliament and former PCC (Pradesh Congress Committee) Presidents". After that, Maken was seen escorting Tytler to few yards and coming back when Tytler left. 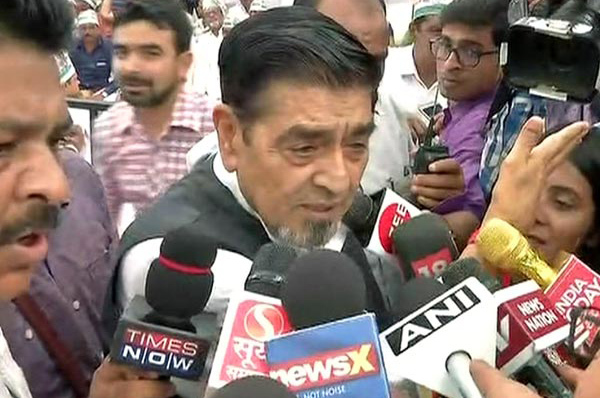 Later talking to ANI, Tytler, who then sat with the Congress workers, said nobody had asked him to leave the stage. "Nobody said (to leave the stage) to me. I went there. I am sitting with the Congress workers. I have been sitting with the Congress workers from last 10 years. I always sit with them," Tytler said. Responding to another question, Tytler said perception about him will be corrected when the time comes. When asked about the Sikh community's sentiment being hurt by Tytler, the 1984 Sikh riot accused Congress leader said, "If you come to my constituency and I will take you to every gurudwara, not a single Sikh. Only Akalis will speak against me as abusing me is their bread and butter." The Congress party organised a nationwide "fast" to protest against the Narendra Modi government and non-functioning of the Parliament. Rahul Gandhi led the protest at the Rajghat on Monday where he shared the stage with Ajay Maken and former Delhi Chief Minister Sheila Dikshit.